Jakarta - PT. 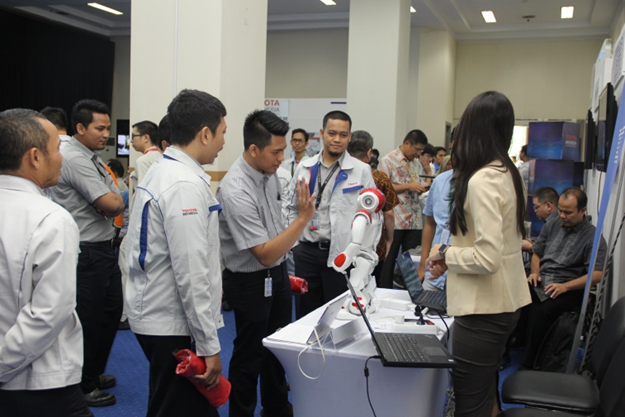 Toyota Motor Manufacturing Indonesia held the IT Innovation Day 2018 activity, with the theme "Industrial Revolution 4.0", which was held on 18th and 19th of July 2018 at Alphard Hall, TMMIN Head Office. The activity was held to educate about the Industrial Revolution 4.0, what impacts it can give to the business industry, and also how to deal with the Industrial Revolution 4.0 itself. This activity was held by conducting seminars and also an exhibition displaying technologies that are related to the Industial Revolution 4.0. The IT Innovation Day 2018 activity present Shirley Santoso, CEO of ATKearney Indonesia, in a seminar called "Industrial Reform 4.0", and also Panji Wasmana, IBM Indonesia Enterprise Business Leader. Several companies such as Microsoft, IBM, BukaLapak, Fujitsu, Kawan Lama, Adaptive, Infiniti Group, and Hitachi, are also present by bringing in technologies that are related to the Industrial Revolution 4.0 era, and also showing what are the systems have been implemented in PT. TMMIN that conforms to the concept of Industrial Revolution 4.0. With the rapid development of technology, the world has now entered the 4th Industrial Revolution. Industrial Revolution 4.0 technologies such as Artificial Intelligence, 3D Printing, Virtual Reality, has already been used. Therefore, the knowledge and awareness about these technologies is very important, so that the workers are ready to face the challenges that are coming ahead.